Today Mark gives yet another reason for us to believe that Jesus Christ is the Son of God. When Jesus calmed the storm on the Sea of Galilee with just the sound of His voice, His disciples recognized Him as the Lord of creation. If you are a Christian, that same Jesus who was with His disciples in the boat is with you today. Mark shows his readers again and again that Jesus Christ was and is the Son of God. So far in Mark’s gospel, we have already read about Jesus casting out demons, healing the sick, teaching with authority, forgiving sins, claiming lordship over the Sabbath, and calling disciples to surrender their lives to Him. And we are only in chapter four! Mark gives us these episodes from Christ’s earthly ministry to show us that Jesus is Lord. He is God. The things that He did on this earth could only have been done by God. We are left with only one possible response to the Jesus we see in the Bible – to fall on our knees before Him in worship. 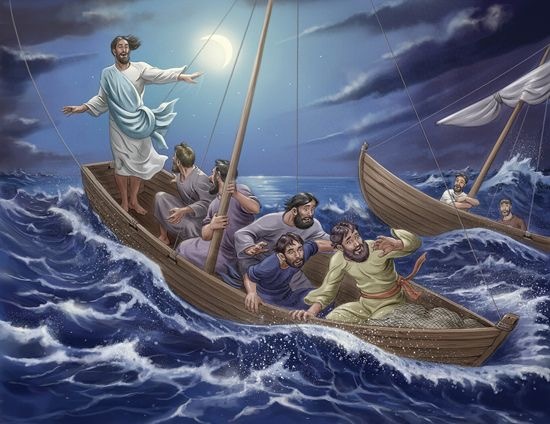 With the calming of the storm, Jesus proves again that He is God, this time by showing by His authority over nature. The disciples were Jews who knew the Old Testament. They knew that is was the Lord who spoke and brought this universe into existence. They knew that it was the Lord who sent the worldwide flood. They knew that it was the Lord who sent the wonders or plagues against the Egyptians to force the pharaoh to let God’s people go free. So when Jesus stopped the terrifying storm from destroying their boat and drowning them, the disciples saw the God-ness of our Lord Jesus. That’s why they asked with a sense of holy fear and awe, “What manner of man is this?” in the boat with them. The disciples’ understanding of who Jesus was and is developed gradually as they spent time with Him daily for three years. From passages like this, it is clear that the disciples did not totally grasp the God-ness of Christ when they first responded to His call to follow Him. In many ways, our Christian life today is like that, too. Sure, we have the whole Bible available to us now, whereas the New Testament had not yet been written at the time that Jesus walked the land of Israel. Even so, we must admit that we know much more about who Jesus is now than when we first accepted Him as Lord and Savior. We don’t have to understand everything about God to come to Him for salvation. But once we are saved, our knowledge of Him will grow as we spend time with Him. As we study the Bible, meditate on the meaning of passages and verses, pray to the Lord honestly, fellowship with other believers, listen to the Word taught at church and elsewhere, and seek to obey His commands, our faith in Him will grow. Learning about Jesus and learning to know Him personally is a life-long process. Even after the great Apostle Paul was old and had walked with Christ for many years, he still confessed that it was his heart’s desire to know Christ more (check out Philippians 3:10-14). And the awesome thing is that He wants us to know Him! He was in the boat with His disciples, and by the power of His Holy Spirit living in us, Jesus is with us, too. Praying that our knowledge of the Savior would increase even more today. Mark reminds us today that after Jesus became known and popular, He began to do much of His teaching in parables. For His audiences both then and now, understanding the parable was more a matter of our spiritual condition than the difficulty of the analogy. Mark tells us in today’s verses that by this point in Christ’s earthly ministry, He is now teaching the large crowds that follow Him with parables. As we saw earlier in Mark 4, parables are short stories that use familiar earthly illustrations to teach spiritual truths. Jesus’ parables are specifically focused on the kingdom of God, what it is like and how people may enter it. In other words, they are usually stories about salvation and spiritual growth. In the stories of the sower, the growing seed, and the mustard seed, Jesus showed us that salvation is a somewhat mysterious work of the Holy Spirit in people’s hearts and lives. The gospel is preached with the call to repent and believe in Jesus Christ. Many people reject the call, but some accept the Lord and are saved. Mark will not tell us many more of Jesus’ parables, but we do see many more specific examples in the books of Matthew and Luke. In today’s summary verses, Mark’s main point is to remind us that the parables keep the unbelieving and disinterested listeners from understanding deeper spiritual truths. But for Jesus’ disciples, followers who believed with willing hearts, Jesus would explain what the parables meant so that they could grow in knowledge and faith. Those really wanted to understand the parables would be given understanding. As C.S. Lewis explained in Mere Christianity, the Christian faith is an experiential or you might say “experimental” faith. You have to try it out to really understand it. You can study the Bible and books about the Bible and Christ for many years, but that is not enough to make you a Christian. Biblical, saving faith is certainly based on a knowledge of the truth, but at some point you must begin to act upon that knowledge by placing personal trust in Jesus. Faith is a living, active thing. It is only as we try to live the Christian life, to seek Christ’s help in obeying His teachings, that we really learn what He means in those teachings. The parables only make sense to us as we experience the spiritual realities that Jesus describes in them. The Holy Spirit will guide us into the truth, but only after we have received Him by accepting Christ as our Lord and Savior. And once we are Christians, we grow only as we walk in the Spirit, which means hearing and doing what He says as He helps us understand the Bible. He will teach us, but only as we are able (ready and willing) to hear. Praying again for us all to have ears to hear today! We have another short parable in today’s passage. The Parable of the Mustard Seed reminds us that God’s kingdom grew from small, humble beginnings into the greatest kingdom of all time. Even today, great spiritual revivals still often start with a just few dedicated disciples of Jesus Christ. 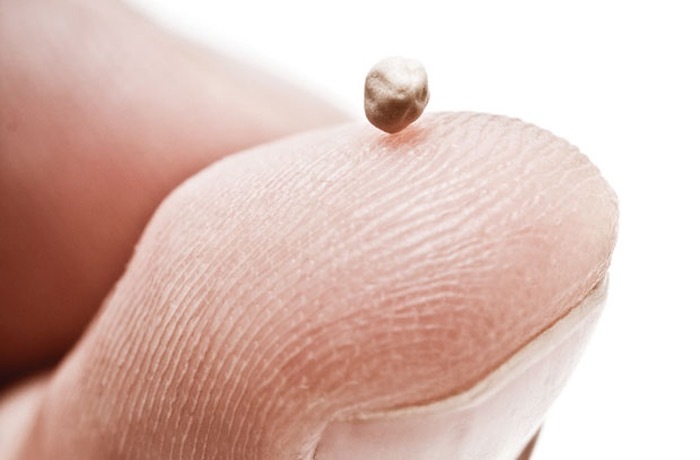 The mustard seed is not the smallest seed in the world and wasn’t even technically the smallest seed planted in Israel during Jesus’ time on earth. But it is very tiny and was commonly thought of as the smallest seed, especially considering that it grew into a giant bushes that could be up to nine feet tall (like a tree). Jesus’ main point in this parable is that His kingdom was going to start very small, but it would not stay that way for long. Like the tiny mustard seed, Christianity was so small as to barely be noticed when it was first planted by our Lord and His disciples. Just a traveling rabbi and His 12 followers, wandering through the unimportant provinces of Galilee and Judaea. But just 300 years later, Christianity had become the dominant religion of the great Roman Empire. By AD 325, the new religion was so widespread and popular that the emperor himself, Constantine, became a Christian and made the previously persecuted faith legal. Now Christianity has spread all over the world and as in the final stages of reaching all the remote pockets of Africa and Asia that have not yet heard the name of Jesus. Roman historians in Jesus’ time would have never have predicted such incredible growth. But Jesus did. God’s kingdom continues to spread today. The work of Christ goes on, and we have the privilege of joining Him in ministry labors that have eternal value. In our country, state, county, and school, the great need now is for revival. Our culture is rapidly losing all sense of a biblical worldview and commitment to Jesus Christ. Across all Christian denominations, church membership and attendance are in decline. More and more people are growing up in America without any knowledge of the Bible and what it actually teaches, without any understanding of who Jesus really is. Even in our own school, many of our students do not attend church regularly or read their Bibles and pray on their own. But the Word of God, the seed of the gospel, is still available to us. We still have the great weapon of prayer. If we turn to the Lord in humble repentance and faith, I believe that He can still do an awesome work of salvation and spiritual renewal among us. The tiny seed can again become a giant bush. But big revivals always begin with personal revivals in the individual hearts of God’s people. Praying for God to stir our spirits today to seek His face. Like the parable about the light and the lampstand from yesterday, today’s story about the growing seed is difficult to understand until we consider the larger context. Remember that Jesus is telling these shorter parables right after the longer Parable of the Sower that he taught and explained at the beginning of Mark 4. If we keep in mind that the topic in this whole chapter is how God’s Word works in people’s lives, then the growing seed parable shows us again the mysterious but certain connection between the gospel, the work of the Holy Spirit, and personal salvation. The growing seed story is about the growth of God’s kingdom as people come to saving faith in Jesus Christ. Like the sower, Jesus’ disciples are to spread the Word, the good news of the gospel message, everywhere they go. 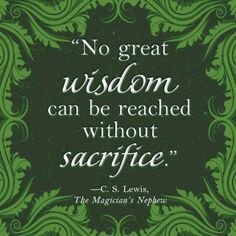 Some people will reject the message immediately (the wayside soil), while others will appear to receive it but in the end also reject the call of discipleship because it requires too much sacrifice (the stony ground) or because they are too distracted by the stuff of this world (the thorny ground). Yet some people will truly understand and accept the gospel. They will really repent, believe, and be born again. These people will prove their faith by then living new lives as disciples of Jesus Christ, growing in faith, love, and godliness over time. What causes all of this to happen in their lives? According to today’s Parable of the Growing Seed, Jesus says that the salvation of believers appears as a mystery to us. Like the growth of a seed into a crop, we see the results after a period of time but don’t know exactly how it happened. The gospel seed is sown in people’s hearts, and then God’s Holy Spirit goes to work. The Spirit convicts these people of their sinfulness and need for a Savior. He shows them that the only way to be saved is by trusting in Jesus Christ and His death and resurrection on their behalf. He brings them to the end of themselves and He gives them the desire and power to repent and believe. The Spirit persuades them to surrender their lives to the lordship of Jesus Christ. This process of a person coming to Christ seems invisible to us, but not to God. When the person is finally ready, God saves them and they are harvested, or come to life in Christ. As we share our faith with unbelievers and pray for their salvation, we must recognize that if they get saved, it is the work of God. It is His Word and Spirit that cause people to desire and receive salvation. But we do not always know exactly what is happening in a person’s heart and life. Sometimes we think a person is surely willing to accept and follow Christ because they have a Christian home or seem like a really nice person, but they keep holding back from making that commitment. Other times, we think a person is very disinterested in spiritual things and far from God, only to see them come down the aisle at a public invitation and catch fire for Jesus. Only when we get to know people and listen to what they are saying, only when we personally engage them about their relationship with the Lord can we have a chance to see where they really are with God. Even then, we must still be ready for surprises when it comes to people’s salvation. When you look back on your own salvation, did anybody else really know what was going on in your heart and life in the days, weeks, or months before you got saved? Probably not. But you did, and more importantly God did. The Word and Spirit brought you to saving faith, and you can trust that He is also at work in the lives of people around you. This passage is the first of three challenging texts for this week. 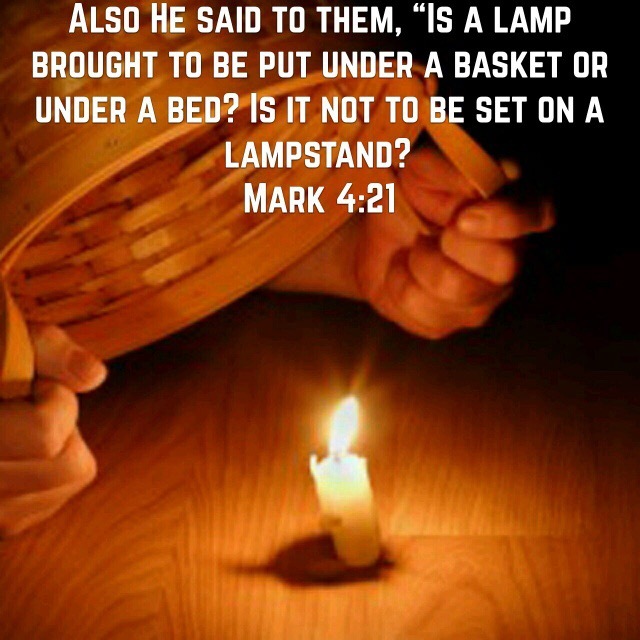 The best way to understand Jesus’ analogy of the light from the lampstand is to connect the illustration with the last section, the Parable of the Sower. If we see the lamp as the Word of God or more specifically the gospel message (like the seed sown by the farmer), then the meaning becomes more clear: Jesus wants His disciples to share their gift of the understanding of the kingdom of God with others. The emphasis of this passage is responsibility. Christ’s disciples have been enlightened by the Holy Spirit to understand the parables and receive salvation. To them it has been granted to grasp the mysteries of the kingdom of God. But they are not keep that privilege to themselves. Instead, Jesus is telling them that they must be faithful to share what they have learned with others, to help Him spread the gospel. As they obey by teaching and preaching the Word as Christ’s ambassadors, the disciples will receive greater and greater spiritual knowledge. They have been entrusted with the light of the the gospel of hope. They must not hide such a precious gift from the world, but rather freely share the truth with all who will receive it. As Christians, we should never stop praising God for our salvation. By giving us the power to understand and believe the gospel, God gave us the most incredible gift anyone could ever receive. From the point of our salvation forward, we have been given the important task of being Jesus’ witnesses to the people whom the Father sends into our lives. We have Jesus, the “Light of the World,” and people all around us are dying in darkness. When we freely and lovingly share the gospel message with others, we experience joy and spiritual growth just as Christ promises in today’s text. If you feel stuck in your spiritual progress, try praying for opportunities to share Jesus and follow God’s leading when those opportunities come. Pray for the spiritual needs of others, especially family and friends who have not yet understood the light of the gospel. It may be that God is causing you to feel apathetic and restless to drive you to embrace His passionate love for the lost.